Nicosia, known locally as Lefkosia or Lefkosa (Turkish), population 200,686 (2001), is the capital of Cyprus and of the unrecognized Turkish Republic of Northern Cyprus. Located on the Pedieos river, Nicosia is the center of an administrative district, and it is currently the only divided capital city in the world, with the northern (Turkish) and southern (Greek) portions divided by the "Green Line", a demilitarized zone maintained by the United Nations, although unlike Cold War East and West Berlin, few use the terms North Nicosia and South Nicosia. The city is a trade center and manufactures textiles, leather, pottery, plastic, and other products. 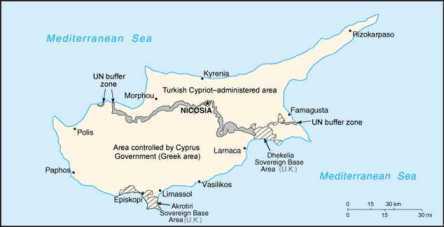 Known as Ledra or Ledrae in ancient times, the city was the seat of the kings of Cyprus from 1192, became a Venetian possession in 1489, and fell to the Turks in 1571. Nicosia was the scene of extreme violence in the period just prior to Cypriot independence in 1960. Since the Greek supported coup and Turkish invasion which followed it in 1974, part of the city's northern sector has been inside the boundary of a United Nations buffer zone. The tombs of the Lusignan kings are in the former Cathedral of St. Sophia, now a mosque in the northern sector. The city also has well-preserved Venetian fortifications, built in the 16th century, which encircle the old, medieval part of the city.